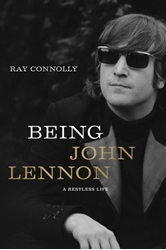 Capsule review: An intimate portrait of John Lennon. Beatles Radio: The Beatles, Solos, Covers, Birthdays, News The Fab 4 and More! In his author’s note, Connolly recalls Yoko Ono’s phone call on the afternoon of Monday, Dec. 8, 1980, asking him to come to New York right away. “The BBC has been here this weekend,” she told him, contradicting her earlier message. Connolly booked an early flight for the next day, but never made the trip. On Dec. 9, Lennon was shot and killed outside his apartment building on Manhattan’s Upper West Side. So much has been written about Lennon and The Beatles. Is there anything more to tell? Connolly has given us insights into Lennon’s often sharp-tongued and caustic comments, a legacy of his Liverpool upbringing.